Choose this option to make a donation in the amount of your choice. You will be prompted for the amount on the next screen. Thank you. 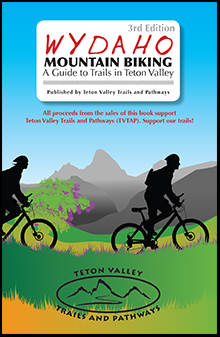 TVTAP represents a valuable asset for Teton Valley and your contribution and membership assure that we can continue to serve our mission of a connected community. Support our Nordic Grooming program in Alta, Teton Canyon, Teton Springs and Pioneer Park. All donation levels recive our Print Newsletter, Annual Report, and Email Updates. 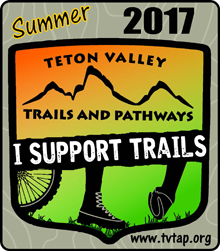 Sticker -"I Support Trails" sticker with your membership donation of $50 or more. Join TVTAP today! TVTAP WYDAHO Guide Book - $12 + $1 shipping. 3rd edition! Updated in 2016.